The American Samoa Small Business Development Center (SBDC), a program under the American Samoa Community College, held its annual Advisory Board Meeting on Friday, December 4th, to provide an overview of the Center’s accomplishments during 2015, recognize innovative businesses in the Territory, and present the SBDC Nonprofit of the Year Appreciation Award. American Samoa SBDC Director Dr. Herbert Thweatt hosted the meeting, and guests included SBDC Advisory Board members and personnel, as well as the recipients of this year’s Bank of Hawaii business grant. Bank of Hawaii American Samoa Branch Vice President Mr. EJ Ozu was in attendance to present SBDC recognition awards to five businesses who successfully applied for this year’s Bank of Hawaii grants of $5000. Lisa May Wade accepted the award for Polynation, a collaborative community based organization that assists local artisans in realizing and achieving their full potential through product development and marketing. The award for REDz Fast Food, a restaurant with a Persian/Mediterranean influence, was accepted by an associate of owner Jilla Piroozmandi. Duffy and Sina Hudson took home their award for their business Tatau Mania, which focuses on Polynesian tattoo and graphic art. Sapioamoa Galea’i represented award recipients Tropical Blends, a health food restaurant looking to expand with a new location at TJ’s Gym. Yvonne Ballard accepted her award for her enterprise Whut Nut Samoa, which specializes in coconut jam. 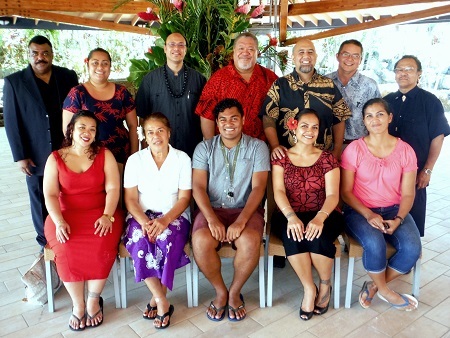 Dr. Thweatt presented the 2015 SBDC Nonprofit of the Year Award to Tupua Roy A. Fua, Director of Pacific Youth and Community Development (PYCD), a community based non-profit organization which focuses on building local capacity and workforce development in areas of health, behavioral health, education and technology. PYCD strives to improve the quality of life for Pacific islanders through training, education, skills-building and certification. Dr. Thweatt explained how, in the course of fulfilling the PYCD mission, Tupua has frequently written grants for small business enterprises initiated by Pacific islanders, thus making a significant contribution to American Samoa’s economy. In reviewing SBDC’s accomplishments over the last 12 months, Dr. Thweatt shared that the Center trained 94 clients and counseled 78, 28 of whom are long-term clients. 48% of these clients were businesses owned by women. SBDC is associated with 14 new business start-ups, with 36 jobs created or retained and a capital infusion of $1,506,000 into the local economy. The latter figure exceeded the goal for 2015 which SBDC had negotiated with the US Small Business Administration, which was an infusion of $672,520. Dr. Thweatt explained that the Center’s goals for 2016 have been adjusted to half that of 2015 due to an ongoing transitional period in local banking as well as personnel changes within the Center as it plans on expanding to a second location in the Fagatogo Market. For more information on the American Samoa SBDC, visit their website at: www.as-sbdc.org. They can also be reached at their headquarters on the ASCC campus at 699-4830.